Strictly Kettering with Debbie’s School of Dance. 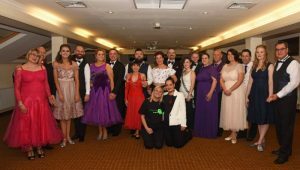 Strictly Kettering for Cransley Hospice is back for 2018! Our nine passionate local ‘celebrities’ will be paired up with professional dancers and put through their paces, learning two ballroom routines and a fabulous show dance to perform in a spectacular final at The Lighthouse Theatre in front of a panel of talented judges. Each dancer will be raising money for Cransley Hospice and we hope that in our 20th Anniversary year, we will surpass last year’s incredible total raised! Tickets are available now! Priced at just £15 each. Please call 01536 452 423 to secure your space.